Get a look at the science behind wireless IoT communication and the benefits and constraints of using wireless communication in IoT apps. IoT, by its definition, consists of “things” connected to the “Internet.” In most cases, there is a wireless connection. However, just as the “things” can be extremely diverse in their size and capabilities, you have many choices when it comes to selecting a wireless technology. Bonus: Have you ever wondered why you can sometimes listen to an AM radio broadcast that is over 1000 miles away? This short read will answer that question. EM signals travel in waves that are invisible to the eye. 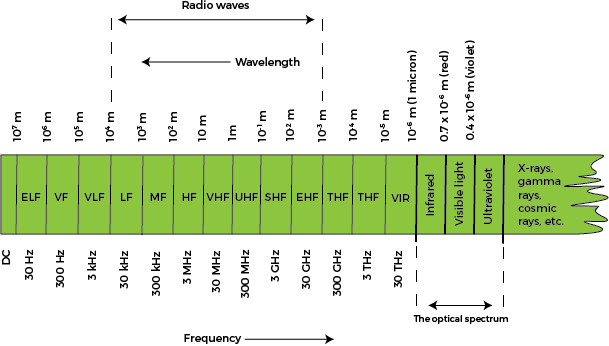 There are two important characteristics of an EM wave, wavelength, and frequency. Wavelength. measured in meters, is the distance from the top of one wave to the top of the next wave. Frequency, measured in cycles per second, is the number of waves passing over a point every second. As you can see in the above graphic, wavelength and frequency are inversely proportional. As frequency increases, wave length decreases. Range: the distance that a useful signal can travel, lower frequencies travel further. Bandwidth: the amount of data that can be transferred per second, higher frequencies handle more data, see sidebar below. Antenna size: impacts device packaging, lower frequencies require larger antennas. Power: more power amplifies the signal to push it farther but drains a battery faster, higher frequencies generally require more power to meet range requirements. Cost: more power, smaller packaging, and the use of a licensed frequency all increase cost. Bandwidth Sidebar: Bandwidth is a function of two variables, frequency, and frequency range. Bandwidth signifies the amount of data that can be carried, measured in bits per second. Data will reach its destination faster at a frequency of 1.00 GHz (1 billion Hz) than it would at 10 kHz (10 thousand Hz). Data will reach its destination even faster if the allowable frequency range is from 1.00 GHz to 1.01GHz. At higher frequencies, a +/- 1% range increase has a much bigger impact on the amount of data transfer than a +/- 1% range increase at lower frequencies. The problem gets even more complicated when you consider the fact that wireless signals are also susceptible to signal weakening interference. Therefore, you must consider the environment when selecting a solution. I will go no further as this is the advanced class but try your cell phone some time in a room with a steel roof and walls. With the basic physics of wireless signals in mind, you can select candidates for wireless technology to use in your IoT application. Basic design principles still apply. You will have primary constraints (size, power, environment, cost, data) and secondary constraints (perhaps serviceability and computational capabilities). Your constraints will narrow down your options and make your choice obvious. Your device transmits mass amounts of data frequently: You will need a high bandwidth solution, a technology at the higher end of the EM spectrum. Your device is size constrained: Your device’s small size will force you to use a smaller antenna, therefore pushing you up the EM spectrum. Your device must transmit data over a long distance: You will need to stay on the lower end of the spectrum and or increase your power capacity. Your device must operate for days, weeks, or months without a recharge of power: You will need to limit the range, perhaps stay on the lower end of the spectrum, and or reduce the data amount and frequency. Or you could invest in a more expensive battery technology. Why Not Just Use SIM Cards? Cellular technology on the surface seems to be a good reliable wireless data transmission solution, especially for outdoor use cases. However, cellular technology relies on a licensed band and service providers, making this option one of the more expensive. Do you know the answer to the AM broadcasting question? Stations such as WJR 760 AM in Detroit broadcast at night at 50,000 Watts of power at a low frequency (760kHz). We learned that lower frequencies travel further and added power increases distance, therefore, allowing it to be heard over a long distance. Published at DZone with permission of Ron Pascuzzi , DZone MVB. See the original article here.